1) In a medium size bowl combine the garlic, onion, bell pepper, oregano, bay leaf, salt and pepper with the crushed tomatoes. 2) Put a half cup of tomato mixture into bottom of slow cooker. Place chicken breasts on top and lightly season with salt and pepper. 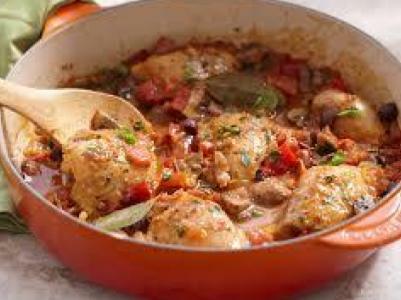 Top chicken with rest of the tomato mixture. 3) Set the crock pot to low 8 hours or high 4 hours. Once cooked top with fresh basil. 4) Serve over zucchini noodles or fresh spinach with a side of steamed veggies.